Objective: As part of an ongoing initiative to generate overall awareness for Philly’s Best, Powerhouse was tasked with developing a celebratory 25th anniversary campaign to build buzz around the brand’s important milestone as well as drive traffic to its Southern California locations with a coordinating anniversary promotion. Challenge: One layer of the comprehensive anniversary campaign, included an influencer component. However, with an anniversary promotion being limited to one day only, Powerhouse had to work closely with social influencers to ensure a quick, yet quality turnaround to maximize the effectiveness of the timely offer. Solution: To secure the most impactful influencer content, as well as efficiently manage timely posts, the Agency planned and executed a local influencer event at a central Philly’s Best location, offering attendees free food and drink, as well as pre-prepared display tables for easy use and optimum branding. Powerhouse also coordinated one-off influencer dining visits for those unable to commit to the event. Results: The Powerhouse team was able to secure visits from 25 reputable, SoCal-based food influencers all resulting in over 10 million social media impressions for the brand’s anniversary promotion. 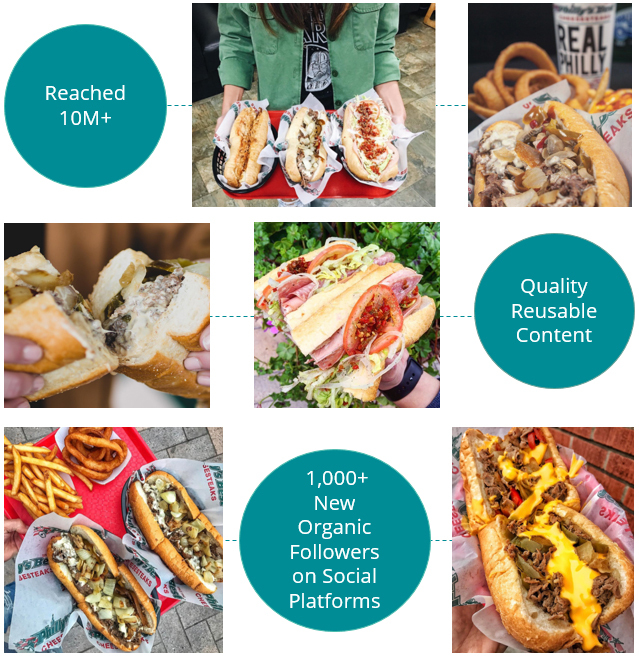 In addition to aggregating several organic images to re-post, the campaign introduced the brand to thousands of new followers, created future influencer partnership opportunities for Philly’s Best and added to Powerhouse’s overall anniversary campaign efforts, which led to the brand to selling 10X the amount of cheesesteaks sold on a regular day.